Olga Alexandrovna Markelova is a writer and literary scholar. Since 2001, her life has been closely connected with the languages, literature and cultures of Iceland and the Faroe Islands. Born in Moscow, she obtained her B.Phil.Isl. (Baccalaureus philologiae Islandicae) from the University of Iceland (2004), and her Ph.D. in Scandinavian Literature from Moscow State University (2005). Her topic was The Emergence of a Faroese National Literature and the Formation of National Consciousness in the Faroe Islands. Published in 2006, this book was the first research into Faroese literature ever to have appeared in Russia. 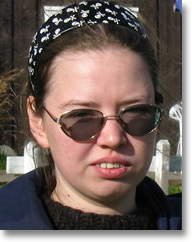 Olga A. Markelova writes poems in Russian, Icelandic and Danish. She has published two collections of poems: Tórshavn, inspired by her stay in the capital of the Faroe Islands, and Razomkni reki [Let the Rivers Flood Free] (both 2005). She has also translated contemporary Danish and Icelandic novels into Russian, the most recent of which is 101 Reykjavik by Hallgrímur Helgason. Her poems, stories and research articles appear in magazines and journals in Russia, Iceland and the Faroes.